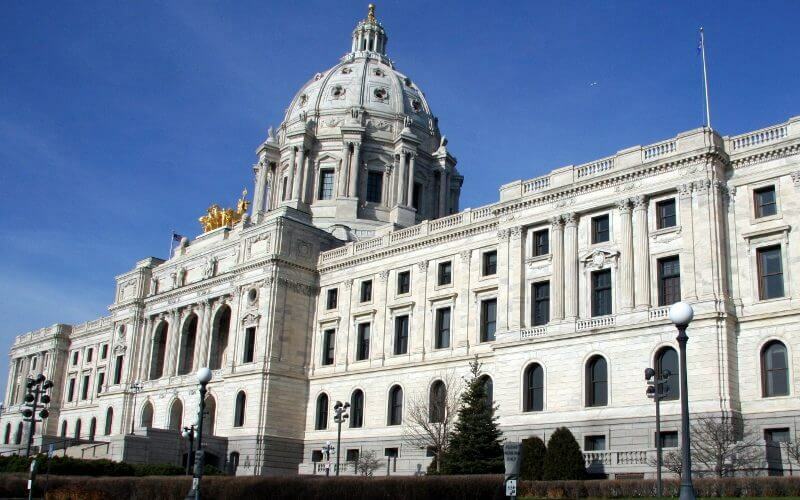 Committee deadlines, revised budget recommendations from Governor Walz and budget targets from House and Senate leadership have made for a busy couple of weeks in St. Paul. Before the legislature takes a break next week, various committees in each body have been putting together and passing two-year budget bills to fund various agencies and other state government functions. Finance committees in each body have until midnight on April 12 to pass major appropriation and finance bills, not including taxes or capital investment. After the legislature returns from break on April 23, action will shift from committee hearing to floor debates on spending bills, followed by conference committees meeting to iron out the differences. Last week, the House Agriculture and Food Finance Division and the Senate Agriculture, Rural Development and Housing Finance Committees marked-up and passed omnibus spending bills (HF 2200/SF 2226). There are differences between the two bills. One of our policy priorities for the legislative session is agricultural research funding, and although neither the House nor the Senate bills include an increase for the Agriculture Research, Extension, Education Program (AGREETT) at the University of Minnesota, both bills maintain base funding for the program at $9.3 million per year. Each bill also designates some of the funds for specific purposes, which could be problematic in retaining or adding research and Extension faculty positions. This will be a key issue to resolve when the bills move into conference committee in early May. The AGREETT program has increased the capacity at the University of Minnesota to address agricultural productivity and long-term sustainability. This week, Minnesota Corn Growers Association (MCGA) President Brian Thalmann and Minnesota Pork Producers Association President Greg Boerboom co-authored an opinion piece in the Mankato Free Press encouraging the legislature to continue this investment for agriculture. In addition to tracking the omnibus agriculture finance bills as they move through the process, we are also tracking omnibus agriculture policy bills. HF 1733 and SF 1859 will likely be considered when the legislature reconvenes later this month. This week, House Democratic leadership unveiled their omnibus tax bill. The House Taxes Committee will hear public testimony and consider possible amendments this week. Included in the bill is state conformity on Section 179 for capital equipment expensing, which would be retroactive to the 2018 tax year. The House tax bill also proposes to increase the Ag2School credit from 40 percent to 70 percent, which if adopted could deliver $30 million in property tax relief for farmers. Senate Republican leadership has indicated they will not unveil their tax proposal until after the legislature returns from break. The Senate Taxes Committee did hear the buffer property tax credit, SF 1937 (Dahms), on April 3. MCGA Past President and Chairman of the Board, Kirby Hettver testified in support of the bill. You can hear audio from the committee hearing here. SF 1937 begins at 30:07. The bill was laid over for possible inclusion in the Senate tax bill. The buffer property tax credit is not included in the House tax bill. House and Senate committees with jurisdiction over transportation and health and human services are also busy finalizing their bills this week. There are significant differences between the House and Senate on their approaches to these major issues, which will need to be resolved before the legislature adjourns on May 20th. Be sure to follow the MCGA blog and its social channels (Facebook, Twitter) throughout session for updates from the Capitol. You can also follow me on Twitter (@AjBilek).